License(s): "read first, buy later"
Everything you really need to know in Machine Learning in a hundred pages! 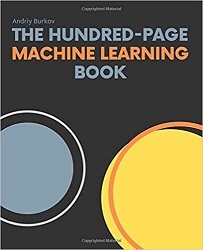 This book provides a great practical guide to get started and execute on ML within a few days without necessarily knowing much about ML apriori. The first five chapters are enough to get you started and the next few chapters provide you a good feel of more advanced topics to pursue. A wonderful book for engineers who want to incorporate ML in their day-to-day work without necessarily spending an enormous amount of time going through a formal degree program. Andriy Burkov is a dad of two and a machine learning expert based in Quebec City, Canada. Nine years ago, he got a Ph.D. in Artificial Intelligence, and for the last six years, he's been leading a team of machine learning developers at Gartner.